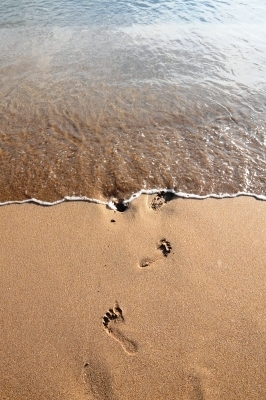 Like footprints in sand washed away by an incoming wave, fear, when allowed to be overcome by love, will be washed away completely. God’s ocean of love, if allowed into the heart, will cleanse us of fear – the fear that cultivates hate, condemnation and division. I am convinced God’s unfathomable, immeasurable, indiscriminate love and grace frightens some because it is uncontainable. I think the fearful know, once the free gift of unconditional love and grace is accepted, they must give away the overflow. And giving away love and grace and mercy and compassion to those considered sinners by the fearfully righteous is anathema to them. You see, fear encourages fists. It fosters clenched jaws and closed minds. It sustains status quo. It deprives lungs of the Breath of Life and starves the soul of Living Water. It neglects the heart, letting it choke and wither. It incites a mindset of hostility. We must not be afraid of love. We must not be afraid of grace. We must not be afraid of mercy and compassion. These are ways of being which connect people, which place us in each others’ shoes, which allow us to know one another as individuals instead of groups. Further, once the decision is made to surrender and accept this miraculous gift, the desire to bless others with the same becomes intrinsic. Hands open, jaws soften, minds become approachable, and the heart blooms. With the help of the Spirit, we see each other through the eyes of Jesus – the eyes of compassion. Am I in that head- and heart-free space all the time? Heck, no. I’m human. I have days when I shake my head and roll my eyes at other humans who’ve been created by the same generous God who created me. But getting up every morning and asking the Holy Spirit to arm me with the strength to produce His fruit (Galatians 5:22-23) is the one of the most powerful prayers I can pray. It helps me get out of the way so God can use me for His purposes. It allows me to latch onto the peace He provides, and eagerly pass along His love, grace and mercy from His compassionate heart.